In the late 1800s there was notorious criminal known at the time only as âThe Vampire.â It was later discovered that this criminal was Sergeant Bertrand and before he was caught in 1849, he terrorized the city of Paris. Bertrand, a military engineer of the 74th Regiment, had been breaking into multiple cemeteries. Once he was in one of the graveyards he would then desecrate tombs, exhume bodies, and then inflict all sorts of horrifying mutilations upon the corpses. The superstitious guards and caretakers spread mass hysteria throughout Paris by claiming to see shadows darting among the old tombstones and declaring that the sturdy walls and iron gates should have been strong enough to keep out any mortal man. Thus the rumors of the mysterious and terrifying vampire began. Once âThe Vampireâ hit a cemetery the guards and security were greatly increased there so that there could be no more attacks, the only problem is that Bertrand never returned to the same cemetery, he always chose a new one. This made it incredibly difficult to find and catch him. But the guards got lucky and one night the filthy Sergeant Bertrand was captured, but only after being shot and accidentally leaving behind a small piece of his uniform at the scene in his haste to escape. Using the bit of uniform and the knowledge that âThe Vampireâ was wounded the officials traced Bertrand to a military hospital. Once caught he was arrested, tried and imprisoned for one year. And so ended the devilish deeds of the mysterious vampire of Paris. Later on in 1901 Sergeant Bertrandâs case was examined by Dr. Alexis Epaulard in his treatise on vampires. 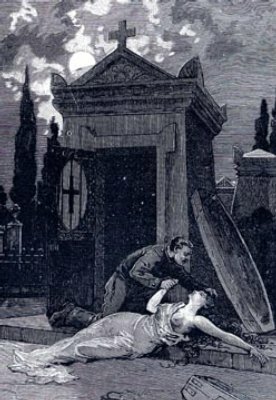 In his paper Epaulard suggested that anyone who loved corpses, platonically or not, should be called a necrophile. Epaulard also introduced the term ânecrosadismâ as a label for those who mutilated corpses, most likely after researching the sick and twisted Bertrand.